Myth & Roid is a contemporary creative unit consisting of vocalist KIHOW, and [email protected] on the production side, boasting a full-scale, international sound. 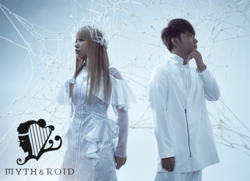 With sharp, catchy melodies and commanding vocal performances, Myth & Roid made their major debut in July of 2015 in collaboration with the hit television anime series, OVERLORD, with their first single "L.L.L." This success along with their coordinated release of the show's opening song, ranked at No. 1 and 2 respectively on iTunes genre rankings, with their general rankings coming in together at No. 3, overall, making it a brilliant debut with the anime series. Tying together a combination of sophisticated digital rock and next generation industrial rock sounds, and an unprecedented progression of vocals, Myth & Roid has also created theme songs for anime titles BUBUKI/BURANKI, Re:Zero - Starting Life in Another World, and OVERLORD III. The grouping of the words "Myth" and "Android" is reminiscent of the past, while simultaneously calling to the future. Brought to life by the idea of opening up to and expanding our current situation of an ever-developing new world of people with the same origins.